The automatic high beams safely illuminate the road in front of you in even the darkest conditions. The high beams automatically disengage when an approaching vehicle is detected. The lights switch back to high illumination when the vehicle has passed. 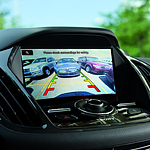 The blind spot information system identifies vehicles coming into the blind spot using an innovative radar system. The driver is alerted to the approaching vehicle with a light located in the side-view mirror, providing an extra layer of passenger security.